Augmented reality headset maker DAQRI has collaborated with the US Navy to outfit the company's Smart Helmet device for use on battleships. The GunnAR system delivers firing commands issued from the gunner liaison officer (GLO) and received by the gunner. 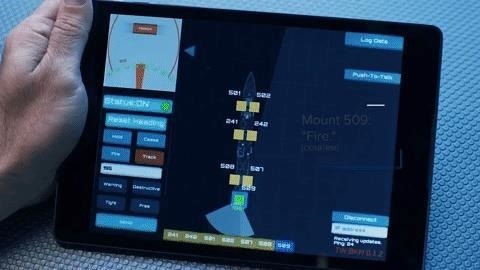 The GLO uses an Android tablet to identify the gun position on a diagram of the ship and select the action, such as track, hold, fire, or cease fire. The tablet is linked to Smart Helmets worn by the gunners, who see the commands in their field of view through their displays. The system also assists the gunner with locating objectives and aiming, all within the gunner's field of view. The helmet, in turn, shares the gunner's view from a mounted camera to the GLO, who can follow the feed through an inset window on the tablet. While the Navy is continuing to implement the system into its fleet, GunnAR did make its live-fire testing debut last month aboard the USS Bunker HIll as part of the 2017 Trident Warrior, an annual naval training exercise. Lt. Robert McClenning, a training officer on the USS Gridley, devised the system, which won last year's Innovation Jam, an event where active-duty sailors present new technology ideas. Battlespace Exploitation of Mixed Reality (BEMR) Lab, located at the Space and Naval Warfare (SPAWAR) Systems Center in San Diego, was tasked with developing the prototype. The system is intended to improve coordination between officer and crew on battleships. The existing process requires the officer to relay verbal commands to a member of the two-person gun crew, who in turn delivers the command to the gunner. "All topside gunners are on the same communications network with the GLO. This, in combination with the noise of topside gun actions, can result is errors and delays in acting on firing commands," said Heidi Buck, director of the BEMR Lab, via email to Next Reality. DAQRI has worked in partnership with the Navy since 2014 under a research and development agreement.